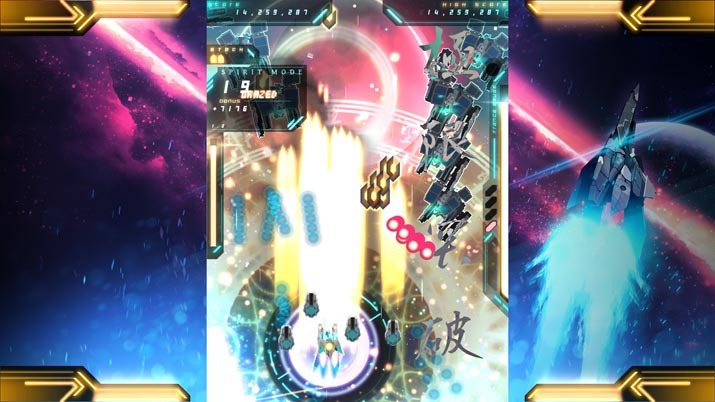 The danmaku genre, also known as “bullet hell,” is a subset of the more widely known “shoot-em-up” genre. Often described as more intense than its scrolling-shooter counterpart, entries that fall under the danmaku banner are characterized by its dense, sometimes hypnotizing, bullet patterns and often unforgiving difficulty curves. 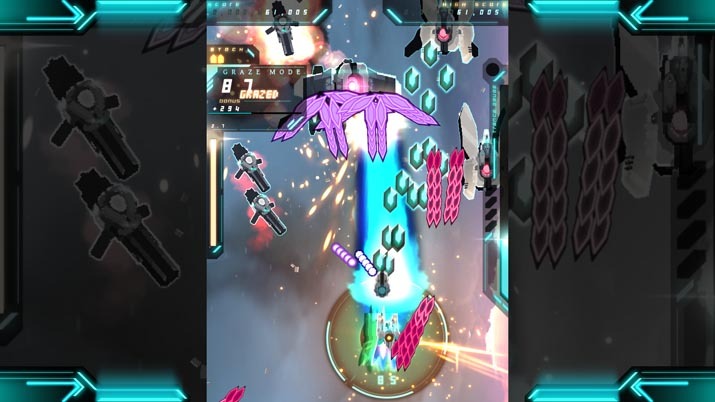 Doragon Entertainment’s newest addition to their Danmaku Unlimited series, Danmaku Unlimited 3, is a true bullet hell shoot-em-up in that it follows the traditional conventions of fractal and isometric bullet sprays and challenging gameplay. 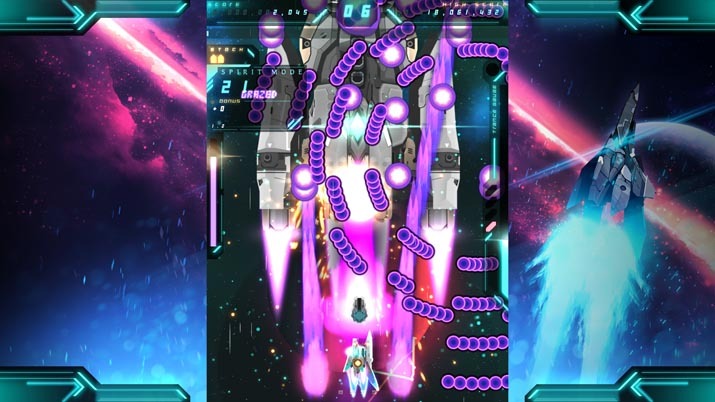 What sets it apart from other titles in the bullet hell genre is the lengths it goes to include newbies and those otherwise unfamiliar or unskilled in handling boilerplate game mechanics. There isn’t much in the way of plot or characters. Unlike those that may feature shrine maidens fighting evil spirits or a girl armed to the teeth warding off otherworldly invaders, Danmaku Unlimited 3 takes a no-nonsense approach and delves right into the gameplay. The only sliver of a story that could even be remotely be hinted at are the titles that appear briefly at the beginning of each stage. The first stage, esoterically named “Yesterday’s Tomorrow,” gives way to “Schräge Musik,” then “Sturmvogel,” followed by “Oroboros,” and finally “Far Beyond The Stars.” While these vague titles could leave one pondering and searching for depth, the brainstorming only lasts a few seconds before the barrage of bullets make its way toward you. Spirit Mode and Graze Mode. Spirit Mode is recommended more for beginners, and manages to simplify grazing down to the one Spirit gauge. Filling the gauge automatically activates Spirit Mode which enhances the player ship’s capabilities and forces enemies to drop gems which count greatly toward your score. Additionally, any contact with an enemy bullet will automatically fire a bomb until depleted and any bullets fired by an enemy will turn into collectible graze points once the originating enemy is defeated. For those more familiar with bullet hell games, Graze Mode places a higher emphasis on grazing, requiring a graze meter to be filled before the Spirit gauge can be filled. Spirit Mode is activated manually, and enemy bullets are converted into collectible graze points only during Spirit Mode. Making contact with an enemy bullet will deplete the entire bomb reserve at once. Starting with Spirit Mode, I was able to comfortably coast through, though I did have to rely on my Continues to even make it to stages four and five. But through the repetition, I started recognizing bullet patterns and finding new plans of attack, something that the danmaku genre makes you do with continued attempts. In making the switch from Spirit Mode to Graze Mode, the importance of eagle eyes and steady hands cannot be understated. With more bullets to graze, one wrong nudge of the directional keys or joystick could bump you right into death. With enemy bullets still retaining their stock-depleting capabilities even after the enemy was blown off the map, there was more to focus on, more to dodge and graze. Boss fights were that much more stressful as the screen wouldn’t clear of the mesmerizing designs of laser rays and bullet arrangements straight out of a grandma’s quilting pattern (from hell, naturally). Despite this, I thoroughly enjoyed myself, while also cursing at myself after each death. In playing through and replaying again and again, there comes the opportunity for unlockables, but only those limited to the player ship’s various shooting patterns and beam styles. Some of these are awarded through campaign progression, while others are awarded through achievements and milestones like grazing a certain amount of bullets or reaching a certain score. Outside of the main campaign, Free Play and Boss Rush modes are also available for a nice change of challenge, replaying previously cleared stages or facing the bosses one after another. Compared to the past two entries in the series, Danmaku Unlimited 3 is a visual masterpiece. The graphics are crisp and clean with an electrically cool palette of purples, violets, and turquoises and the inclusion of dark, bold reds and the occasional streak of gold. Even as an overwhelming abundance of bullets and lasers fill the screen and explosions from enemies and bombs alike act akin to a flashbang grenade going off in slow motion, the smooth and fluid motion of it all solidifies the look. With the quick flash of a transition, I would have to say that one of my favorite visual cues is the traditional kanji script that pops up, then fades, once Spirit Mode is activated or when a boss enters its special attack phase. Coupled with its snap of an audio cue, I found the small visual experience was worth constant pursuit, in addition to all the bonuses that Spirit Mode brought along. Pairing well with the overall smooth and colorful look of Danmaku, the rock soundtrack blends in perfectly with the rest of the aesthetic. The almost post-rock feel of the music helped add a dramatic, motivational edge to make it to the end of each level without coming across as overbearing. While Danmaku Unlimited 3’s Steam page attributes its composer, BLANKFIELD, as a well known Touhou and anime remixer, BLANKFIELD should be recognized in their own right for their original work, particularly for this title.